It requires a lot of fertilizer and water to maintain a healthy almond tree throughout the year and to prepare for–and optimize–production the following year. Those requirements present some very specific challenges. One of the most important issues is water scarcity. California is now in the midst of one of the worst droughts in the state’s history, leading some almond farmers to let their trees dry up, or even have them torn out of the ground. Another issue—although one that might feel less pressing given the current water problems—is the implementation of fertilizer regulations in California, which means that some growers will need to make changes to their fertility practices. Almond growers have little choice except to find the most effective way to deal with both of these issues, and I am working with many California growers to incorporate Accomplish LM into their fertilizer programs to help mitigate both concerns. Using Accomplish LM, growers can utilize fertilizer inputs more effectively and efficiently (as seen in this study of the base product technology), as well as improve their water efficiency (see the Wasco, CA irrigation response study on page 2 of this sheet showing how water gets into the soil profile faster, goes deeper, and stays longer with Accomplish LM). Accomplish LM can also boost almond yields. In a recent almond trial in Merced County, California, adding Accomplish LM to an almond fertility program increased the harvest by 212-303 lbs. per acre (Figure 1). Figure 1. Yield increase with Accomplish LM in a California almond fertility program. The grower’s standard practice was compost applied at 5 tons/acre. 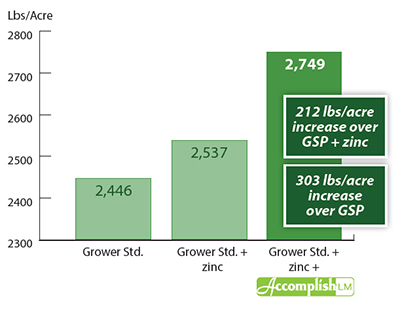 Accomplish LM was applied at 4 quarts/acre, and 7% zinc was applied at 1 gallon/acre. Even though it may seem like almonds are everywhere in California, there are a few problems that must be effectively addressed to protect the current crop and ensure an abundant future for California almonds. Accomplish LM helps growers more efficiently utilize fertilizer and water—two very important inputs—and typically delivers a positive impact on yields. It is also very easy to use: you can simply add it to your current fertilizer mix. For California almond growers, Accomplish LM can play a key part in addressing today’s needs while also preparing for tomorrow.